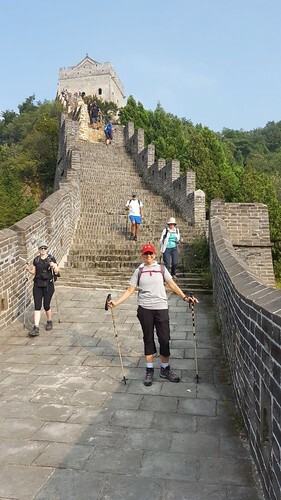 PAWA Trekker, Clare Muhiudeen sends the first despatch from the Great Wall of China. She and her team mates, Zehan Albakri and Rahiyah Yahya, have now got the first day of their long seven day trek under their belts. So what was that first day like? The highlight of Day One was finally getting started on this adventure. Today we did 13,485 steps – and climbed the equivalent of 36 floors in an office building. Our total distance was 9.83 kilometres. Our hotel is an impressive historic barracks which was amazing – but the downside was that the huge compound and many flights of stairs meant we had a lot of extra walking to do. Being far from home, we missed our usual chilli sauce to get through meals – that’s PAWA people for you, always having half our minds on food! The challenge that took us by surprise was when we arrived at the hotel before setting off on our trek and had to haul our luggage up the hotel’s steep steps – it was harder work than we expected. And then after we had hiked almost 10 kilometers and climbed all those thousands of steps, when we got back to the hotel, feeling relieved and uplifted for having achieved the first day’s hard trekking, our poor legs had to walk up more steps to get us back to the hotel! But we are keeping going – with lots of laughter and everyone supporting each other! Clare Muhiudeen is Head of Human Capital and Benefits, International at Willis Towers Watson, Hong Kong. She is a PAWA Founding Charter Member and a PAWA Champion.